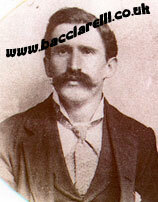 Great-grandfather, Giovanni Battista Bacciarelli, born Dec 1866 in Gera, Lake Como, Lombardy, Italy, was the son of Antonio Bacciarelli and Marvoriglia Dell'Oro / 'Ora (name written in english documents as Mavora Delora). The photograph of him was taken sometime in the 1900's and the original was passed down from our grandfather to my mother. I have not found a birth record for either of his parents in the area at time of writing and belive that their origins may have been in another part of Lombardy / Como or maybe further afield. Giovanni had at least one older brother called Guieseppe/Giaseppe and two sisters Angela Adele and Maria. His parents appear to have followed Italian naming traditions, so I believe there was an older brother called Antonio, possibly other siblings. It has been established by family members who visited the area, that there are no longer any Bacciarelli's living in Gera. Some may have moved to other parts of Italy, emigrated to the UK, USA or other countries. Giovanni was always referred to as 'Battista' by the family. He travelled to England sometime during the late 1800's, although the method and date of arrival is still unclear. As a resident 'alien' he was required to report to the local authorities or constabulary on a regular basis. Giovanni's Identity Book, which we were fortune to find stored with various other documentation, contains a wealth of information, such as the business and residential addresses. He lived and worked at various locations in London, but the records also show him in Colchester, Ipswich, Suffolk, Sussex and Essex before moving back to London. The 1881 census is a little confusing, there are several entries for Bacciarelli, but the most likely candidate is a London serving boy 'Bathita Bacciarelli' whose date of birth is listed as 1857, which is most likely an incorrect transcription or error as another gentleman of the same age is listed as a 'Serving Man'. Giovanni Battista Bacciarelli served in the Italian Army, 2nd District Co, Princenza, Italy between 1887 to 1890, so if the 1881 census listing refers to our 'Battista', he most likely travelled to England to visit his brother before returning to Italy for the compulsory national service. I recently discovered that my grandfather and great grandfather worked as waiters on ships for a while and visited the United States Of America several times so may have had relations there. In the 1891 census and various London Trade Directories, Giovanni and his brother Guiseppe are listed as running a confectionary business called Bacciarelli Bros, 395 New North Road, London until at least 1899. A marriage listing for Giaseppe Bacciarelli in Edmonton shows he married in 1906 to Winifred Clare Williams of Stroud Green, London. Giovanni was married in 1891 to his first wife Silvia Gardella / Gardellor at St Peter's Italian Church, Holborn, London and they resided for a while in London where they had 4 children (Mavoriglia, Guillermo, Guerino and Emma). Silvia died in childbirth with daughter Emma who also died shortly afterwards in September 1896. After her death, the remaining children went to live with their aunts in Milan, Italy before returning to the UK. Giovanni (always known as Battista by the family), married my great grandmother Leah Dunn of Staffordshire in 1900 at the Catholic Church of St Mary, Harwich, Essex and they went on to have 5 children (Andrew, Silvia and Ronald) plus twins Benjamin and Joseph, the latter sadly died at birth in 1902. In 1901 Giovanni was co-proprietor of The Criterion Restaurant, Gt Clacton, Harwich, Essex. Also listed there are his wife Leah and fellow Italian business partner Antoneo Mastaglio. His name is mis-spelled as 'Battista Baccioreli' and similar errors in documentation have made searching for his records quite a challenge! Battista and Antonio dissolved their partnership on 18th September 1901, which was recorded in the December issue of the London Gazette, but he continued to be the Proprietor of The Criterion Restaurant with wife Leah for several years. 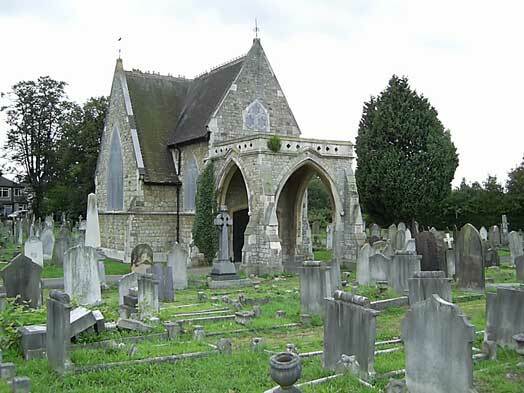 Giovanni passed away in 1937 and was buried in Brockley & Ladywell Cemetary, (formerly Deptford Cemetary) Ladywell Road, Deptford, London on 16 April 1937. Although he has gone, his story is by no means complete, and any information or pictures you can share would be welcome!